The stunning Hibiscus Pool at Grand Wailea, A Waldorf Astoria Resort. There's no such thing as a one-size-fits-all, perfect hotel. What is it that transforms your vacation from ordinary to extraordinary? Are you a foodie who wants a Michelin-starred chef tableside? Are you just so ready for a two-hour massage, followed by a hammam steam, followed by a nap in a lush garden? Or is your holiday heaven an endless sea of green links? Well then, yes and yes and yes and yes, because . The Wow Factor: The exclusive and newly renovated yacht club. There are waterfront hotels, and then there is the new Yacht Club at Boca Raton Resort, an exclusive hotel within a private resort, opening November 1. Picture yourself welcomed at your own resort entrance, strolling the shores of the luxury marina past the grand fountains to your spacious Yacht Club luxury suite overlooking Lake Boca and the Intracoastal Waterway. Refreshed suites — thoughtfully styled with room to spread out, from 600 to 1800 square feet — have private balconies with sweeping views of the Atlantic Ocean. The perks don't end there, as guests also have full access to all of Boca Raton Resort's 356 acres, amenities, pools, and private beach. The Wow Factor: A taste of Paris in downtown Chicago. At the intersection of Parisian cafe culture and glam Gold Coast style sits Margeaux Brasserie, Michelin-starred chef Michael Mina's much-anticipated Chicago debut, where classic bistro fare — escargot à la bordelaise, tomato tatin, foie gras parfait — has been reimagined and prepared with locally sourced and traditionally Midwestern ingredients. The wine and spirits program will mirror the pairing, with French cocktails made, a rotating champagne cart, local brews, imported French beers, and the best American and French wines. The Wow Factor: The Grand Masters. The artwork takes center stage in Indianapolis, one of the emerging cities in the United States, in the Conrad's rooms, public spaces, and on-site gallery. Long Sharp Gallery, on the hotel's first floor, displays a wealth of modern and contemporary works by such distinguished artists as Picasso, Warhol, Lichtenstein, and Basquiat. “Regional Masters” is a semi-permanent exhibition displaying artwork with ties to the city of Indianapolis. Guests can review the collections on their own or take a guided tour led by one of the hotel's Art Ambassadors. The Wow Factor: The cuisine. Waldorf Astoria's rich culinary legacy includes inventing the Waldorf salad, eggs benedict, and 24-hour room service. It continues today at Jean-Georges Beverly Hills. The contemporary California cuisine by master chef Jean-Georges Vongerichten strikes an artful balance between sophisticated and simple, with options ranging from the signature avocado pizza to a savory tasting menu with wine pairings. Are you in town for business without a moment to spare? Lunch 38 will power you through your meal in under an hour with an easy three-course menu for just $38, or dine al fresco at The Rooftop by JG and take in sweeping, 360-degree views of the city. The Wow Factor: The grandeur water features. 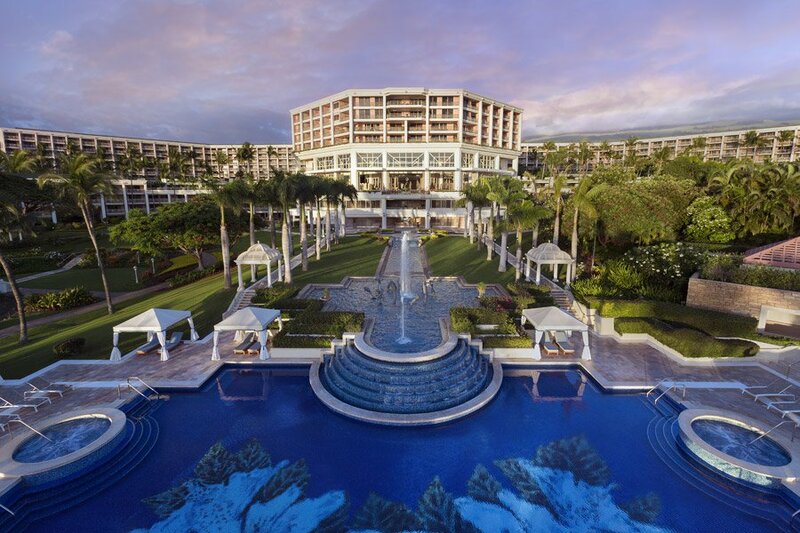 Whether you want a laid-back beach day or a memorable pool day, the water features at Grand Wailea will appeal to the young and the young at heart. Relax poolside at one of the casabellas at the Hibiscus Pool, Grand Wailea's adult-only pool. Explore the whitewater rapids, rope swing, grotto bar, lazy river, and waterfalls that make up the Wailea Canyon Activity Pool. Soak up the view from your beach chair all day on award-winning Wailea Beach. With nine separate pools on six different levels, the aquatic options are endless, but the experience of a lifetime awaits at the world's first water elevator or the resort's newest addition, a 14-second, 22-mile-per-hour, three-story drop on the Lava Tube slide. The Wow Factor: Not one, but five championship golf courses. There's no shortage of world-class golfing in the fairway mecca that is Palm Springs, and the legends all played at La Quinta Resort and Club. The five championship greens include the top-50 ranked Stadium Course at PGA WEST, which was designed by Pete Dye, and the Irish- and Scottish-style Dunes Course, which has hosted the PGA Club Professional Championship and the Californian State Open. Just try not to get too distracted by the majestic Santa Rosa Mountains as you're teeing off. The Wow Factor: Quintessential New York views. In a neighborhood as crowded as midtown Manhattan, nothing is more luxurious than an all-suite hotel that is mere steps away from attractions such as Central Park, the Theater District, Rockefeller Center, and dozens of top restaurants. Then again, with rooms this spacious and views this postcard-ready, you might be tempted to stay in and make the most of everything on site, from one of the largest hotel fitness centers in the city to the impressive cocktail selections and fusion of Modern American cuisine at the London Bar.